G3YNH: Digital Readout & All-Mode Adapter for RAcal RA17, part 3. Digital Readout and All-Mode Adapter for the Racal RA17. 1MHz Reference Input and CIO Feeds. Ref. Input and CIO: Circuit Diagram (52K GIF, 1115 x 617 pixels). Refer to the above circuit diagram while reading this section. The 1MHz reference output from PL3 on the RA17 is used to derive the counter reference and the fixed 100KHz CIO signal. This enables calibration of the complete receiver installation to take place in a single step, by adjustment of the trimmer C2 in the RA17. An extract from the RA17L circuit (below) shows how the 1MHz output is implemented. The RA37 input circuit was unknown to the author at the time when the digital-readout adapter was designed, but the input impedance chosen seems to have anticipated the Racal designer's intentions reasonably well. Consequently, it is possible to place a T-piece at the back of the adapter and feed the 1MHz reference on to an RA37 or 137 (note however, that the digital readout (part 4) does not have a reversed tuning mode for the LF adapter). Connection between the units uses a total of about 1m of RG58U coax., but given the 5nF shunt capacitance at the RA17 output, the length cannot be considered to be critical. One modification to the 1MHz input which might be considered worthwhile, would be to provide the adapter with its own 1MHz crystal oscillator, and a PLL to lock it to the 1MHz signal from the RA17 when it becomes available. This would make it much easier to test and service the adapter away from the RA17, and would eliminate the nonsense display from the frequency readout while the 1MHz oscillator valve in the RA17 is warming up. A lock indicator LED should be provided to assist troubleshooting of the external reference feed. The 1MHz signal is divided by 5000, in two 74LS390 ICs, to provide the 200Hz counter time-base reference. A tapping on the divider chain at 100KHz is also used for the fixed frequency carrier insertion feed. For this reason, the first divide-by-10 stage is wired as bi-quinary (divide-by-5 followed by divide-by-2) to give a symmetric square wave optimal for driving the square-to-sine converter stage. The purpose of this stage is to filter-out any audible low-frequency components which may be present in the raw output from the divider chain (due to feedback through the power supply etc.). Switching off the supply to this stage and shorting its output to ground also helps to suppress the fixed 100KHz signal when it is not required, and in practice the arrangement is completely effective. The filter is a single high Q tuned transformer, pile wound on a 1/4" former with end-cheeks 10mm apart and a dust-iron slug. The primary was wound with 36swg wire, the secondary with 28swg. The 110pF resonating capacitor is a silvered mica type. The actual details of the transformer and capacitor are not critical however, what matters is that the tuned circuit peaks sharply at 100KHz. 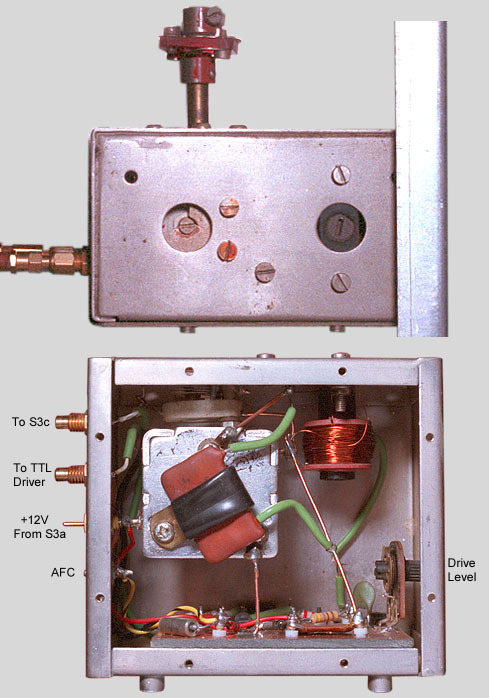 The transformer is used without a screening can (to maximise Q) but is placed inside the counter screening compartment where no other inductors or magnetic devices reside. The variable CIO is a straightforward common-drain Hartley oscillator, with a varicap AFC circuit controlled by the frequency counter. The AFC system is used to lock the CIO to the nearest 100Hz step, and will be discussed in part 4. Two 1MΩ resistors are provided to float the AFC line at Vcc/2 if the control voltage is disconnected. In all other respects, the CIO is a normal VFO, the output of which is fed through a buffer amplifier and thence to the product detector as required. The CIO sample for the counter is taken from the buffer output, and fed through yet another buffer to prevent creep-back of digital noise into the product detector. With the component values shown, the CIO tunes from about 95 to 105KHz. The RA17 tunes HF for clockwise rotation of the 'Kilocycles' knob; and so, for ergonomic reasons, the CIO tuning knob is arranged to do likewise. Both the fixed and the variable CIO feeds are provided with a drive level adjustment. These presets are used to eliminate any perceived change in audio volume on switching between fixed and variable, the adjustment procedure being to turn both up full and back-off whichever is loudest. No problems have been experienced with this input stage in practice, and the amount of detuning caused (approx. 1KHz per 25pF) is easily accommodated by the sliding pointer on the 'Kilocycles' film scale. The thermal stability of the oscillator appears to be unaffected. The fact that the capacitance of the VFO input and cable does detune the interpolation receiver slightly opens up the possibility that the adapter can be fitted with a clarifier control. The tunung rate of the RA17 is rather fast; and although the mechanism is adequate to allow a skilled operator to resolve SSB reasonably easily, it can be extremely difficult to nudge the receiver on to an exact frequency (e.g., while checking calibration against a standard frequency broadcast). 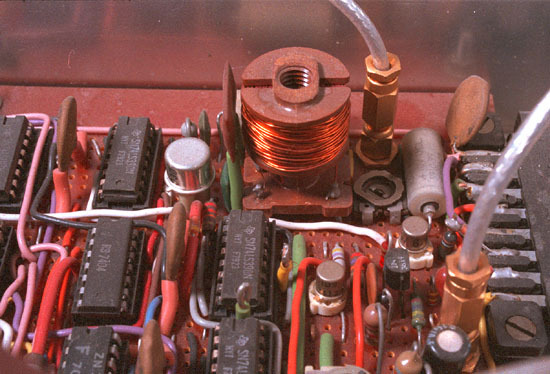 A 25pF variable capacitor wired directly across the VFO input socket (and taken to the front panel with a long plastic extension spindle) will give a fine-tuning range of about ±500Hz (and a miniature 3:1 reduction drive should make precision tuning extremely easy). A clarifier was not fitted to the original adapter, for the simple reason that the author was unaware of the potential problem until after it was built.